QUEEN Somebody To Love (Rare official UK B.P.I. 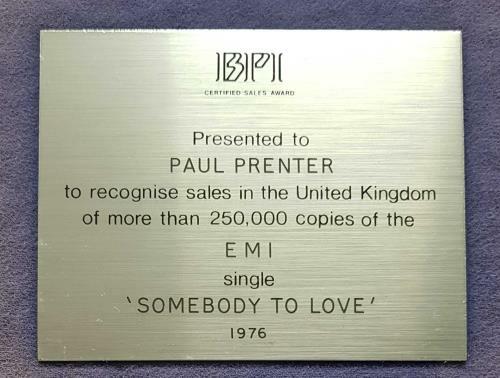 Certified Silver 7" award for the single released in 1976, issued to commemorate single sales in excess of 250,000 copies, and presented to Freddie Mercury's personal manager/assistant Paul Prenter. 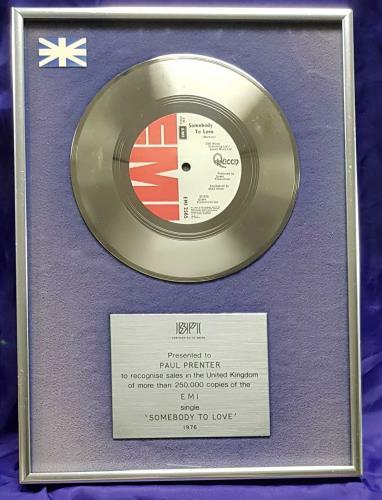 This nicely framed and glazed award measures 10" x 14" in size, and features a silver 7" discs above the authentic, custom engraved dedication plaque, all mounted on a blue felt background with a Union 'Jack' Flag in the top left corner, and in a silver coloured metal frame. The blue mount has faded over time but is still a fantastic item, and would look amazing on any fans wall).